Are you an international customer? If so, we can ship your order to countries outside of the United Kingdom. For a more detailed quote, please register your details, complete the quotation with the products you require and we will contact you with the total shipping costs. Shipping and delivery times will be based on your location and consignment size. For certain areas, we may request you to arrange the collection of your order. * Please be aware the above transit times are based on working days (Monday-Friday) and exclude and public/local holidays. 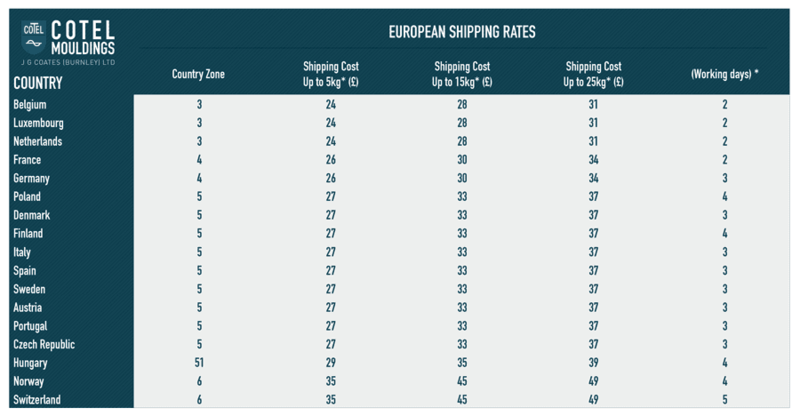 Please also note these rates are for guidance purposes only, certain areas may carry surcharges – upon receipt of your completed quotation we will contact you with the total shipping costs. Discounts are applicable to overseas orders which start at quantities of 100, 250, 500 and 1000pcs. Please contact us directly for a quote on larger orders. If an order becomes regular we can also arranged tailored pricing packages to suit your requirements. Just call +441282 424376 or email sales@cotel.co.uk for more information. VAT is charged at the 20% UK rate. If you are within the EU, you will need to supply your EU VAT Number and Member State Code to sales@cotel.co.uk . If you are ordering from outside the EU, VAT is exempt provided you contact sales@cotel.co.uk with the details of your order and location. For Non-EU customers customs clearance charges are not included in any shipping costs charged and will require payment by the customer. We can deliver worldwide. Just contact our sales team with your order and we can manually calculate your quote for delivery overseas. Quoting for overseas differs from European deliveries as we need to account for air mail, greater distances and volumetric weight. For certain areas, we may request you to arrange the collection of your order. When your order is shipped using our UPS system we will provide you with the consignment tracking number. This will appear on the invoice and can be tracking on the UPS website allowing you to monitor the location and status of your order prior to delivery. If you need your order to arrive quicker than in the table above, you can arrange for collection with your own courier, or ask for us for a faster air shipment quote.